The Montessori learning experience is cumulative: what a child learns in the kindergarten year builds on what was learned in previous Montessori years. The kindergarten year is the culmination of this learning when the child internalizes these early concrete experiences, building a strong educational foundation. The value of the first two years cannot be fully realized if the child does not continue working with the Montessori materials to complete the three-year cycle. The Kindergarten year in Primary Montessori is the final year of a three-year cycle. Your child has spent two years preparing to be the class leader. Kindergarteners thrive on helping the three and four year olds and being a role model. Mentoring helps them both socially and academically. As they share work they have mastered, they reinforce what they know and strengthen their social confidence. Earlier lessons come together during the Kindergarten year and become part of how the child thinks and achieves. 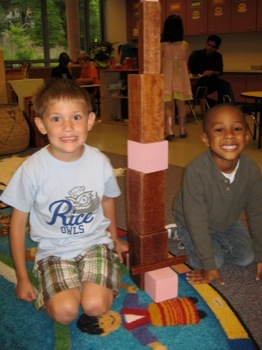 Montessori students use concrete materials and experience to learn academic subjects such as math and reading. In the final year, they continue work with core classroom materials, using them as a bridge into abstract thinking. Many Montessori parents are amazed when a four year old, who did not appear to be reading, “magically” explodes into reading and writing during the Kindergarten year. The hands-on math materials, such as the golden beads, become less necessary as the child progresses to more abstract pencil and paper math exercises. It does feel like magic, but it is really the culmination of the first two years in the Primary Montessori classroom. Montessori Kindergarten children have spent two years in the same classroom where they were supported, treated with respect, and encouraged to behave responsibly. They know what to expect, have learned how to learn, and to value and care about the other children in their classroom community. Their teacher knows them well and stands ready to guide them through the Kindergarten year. After completing Kindergarten, Montessori students can continue into Arlington’s free Elementary Montessori program at Drew Model School, go to a private Elementary Montessori school, or enter traditional first grade. Most students enter traditional first grade at their neighborhood school. Students who complete the three-year cycle Primary Montessori and enter traditional first grade generally make the transition easily. These students are normally self-confident, enthusiastic, advanced learners, comfortable in a variety of environments. Primary Montessori students typically do well in traditional first grade classrooms. Some parents move their children out of Primary Montessori after the four-year-old year because they worry there will not be space for them in first grade. However, APS has space for all first grade students in neighborhood classrooms so this need not be a concern. When it comes time for you to decide your child’s educational future, please talk to your child’s teacher about the importance of the Kindergarten year in Montessori.